This year marks the 50th anniversary of the publication of Marshall McLuhan’s best known work, Understanding Media. To mark the occasion, I’m republishing some thoughts on the man and the book that originally appeared here in 2011. I also had an opportunity to chat about McLuhan’s legacy with Brooke Gladstone in a segment of On the Media airing this weekend, which you can listen to here. The image above is a detail from a MAD magazine cover. 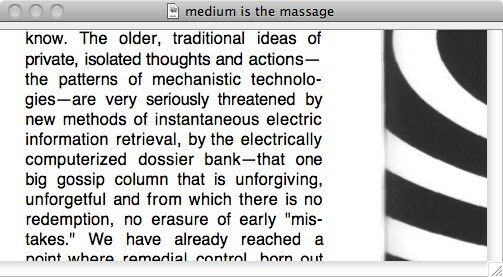 Watching McLuhan, you can’t quite decide whether he was a genius or just had a screw loose. Both impressions, it turns out, are valid. As the novelist Douglas Coupland argued in his recent biography, Marshall McLuhan: You Know Nothing of My Work!, McLuhan’s mind was probably situated at the mild end of the autism spectrum. He also suffered from a couple of major cerebral traumas. In 1960, he had a stroke so severe that he was given his last rites. In 1967, just a few months before the Mailer debate, surgeons removed a tumor the size of a small apple from the base of his brain. A later procedure revealed that McLuhan had an extra artery pumping blood into his cranium. Between the stroke and the tumor, McLuhan managed to write a pair of extravagantly original books. The Gutenberg Galaxy, published in 1962, explored the cultural and personal consequences of the invention of the printing press, arguing that Gutenberg’s invention shaped the modern mind. Two years later, Understanding Media extended the analysis to the electric media of the twentieth century, which, McLuhan argued, were destroying the individualist ethic of print culture and turning the world into a tightly networked global village. The ideas in both books drew heavily on the works of other thinkers, including such contemporaries as Harold Innis, Albert Lord, and Wyndham Lewis, but McLuhan’s synthesis was, in content and tone, unlike anything that had come before. When you read McLuhan today, you find all sorts of reasons to be impressed by his insight into media’s far-reaching effects and by his anticipation of the course of technological progress. When he looked at a Xerox machine in 1966, he didn’t just see the ramifications of cheap photocopying, as great as they were. He foresaw the transformation of the book from a manufactured object into an information service: “Instead of the book as a fixed package of repeatable and uniform character suited to the market with pricing, the book is increasingly taking on the character of a service, an information service, and the book as an information service is tailor-made and custom-built.” That must have sounded outrageous a half century ago. Today, with books shedding their physical skins and turning into software programs, it sounds like a given. You also realize that McLuhan got a whole lot wrong. One of his central assumptions was that electric communication technologies would displace the phonetic alphabet from the center of culture, a process that he felt was well under way in his own lifetime. “Our Western values, built on the written word, have already been considerably affected by the electric media of telephone, radio, and TV,” he wrote in Understanding Media. He believed that readers, because their attention is consumed by the act of interpreting the visual symbols of alphabetic letters, become alienated from their other senses, sacrifice their attachment to other people, and enter a world of abstraction, individualism, and rigorously linear thinking. This, for McLuhan, was the story of Western civilization, particularly after the arrival of Gutenberg’s press. By freeing us from our single-minded focus on the written word, new technologies like the telephone and the television would, he argued, broaden our sensory and emotional engagement with the world and with others. We would become more integrated, more “holistic,” at both a sensory and a social level, and we would recoup some of our primal nature. But McLuhan failed to anticipate that, as the speed and capacity of communication networks grew, what they would end up transmitting more than anything else is text. The written word would invade electric media. If McLuhan were to come back to life today, the sight of people using their telephones as reading and writing devices would blow his mind. He would also be amazed to discover that the fuzzy, low-definition TV screens that he knew (and on which he based his famous distinction between hot and cold media) have been replaced by crystal-clear, high-definition monitors, which more often that not are crawling with the letters of the alphabet. Our senses are more dominated by the need to maintain a strong, narrow visual focus than ever before. Electric media are social media, but they are also media of isolation. If the medium is the message, then the message of electric media has turned out to be far different from what McLuhan supposed. Of course, the fact that some of his ideas didn’t pan out wouldn’t have bothered McLuhan much. He was far more interested in playing with ideas than nailing them down. He intended his writings to be “probes” into the present and the future. He wanted his words to knock readers out of their intellectual comfort zones, to get them to entertain the possibility that their accepted patterns of perception might need reordering. Fortunately for him, he arrived on the scene at a rare moment in history when large numbers of people wanted nothing more than to have their minds messed with. McLuhan was a scholar of literature, with a doctorate from Cambridge, and his interpretation of the intellectual and social effects of media was richly allusive and erudite. But what particularly galvanized the public and the press was the weirdness of his prose. Perhaps a consequence of his unusual mind, he had a knack for writing sentences that sounded at once clinical and mystical. His books read like accounts of acid trips written by a bureaucrat. That kaleidoscopic, almost psychedelic style made him a darling of the counterculture — the bearded and the Birkenstocked embraced him as a guru — but it alienated him from his colleagues in academia. To them, McLuhan was a celebrity-seeking charlatan. Neither his fans nor his foes saw him clearly. The central fact of McLuhan’s life was his conversion, at the age of twenty-five, to Catholicism, and his subsequent devotion to the religion’s rituals and tenets. He became a daily mass-goer. Though he never discussed it, his faith forms the moral and intellectual backdrop to all his mature work. What lay in store, McLuhan believed, was the timelessness of eternity. The earthly conceptions of past, present, and future were by comparison of little consequence. His role as a thinker was not to celebrate or denigrate the world but simply to understand it, to recognize the patterns that would unlock history’s secrets and thus provide hints of God’s design. His job was not dissimilar, as he saw it, from that of the artist. That’s not to say that McLuhan was without secular ambition. Coming of age at the dawn of mass media, he very much wanted to be famous. “I have no affection for the world,” he wrote to his brother in the late thirties, at the start of his academic career. But in the same letter he disclosed the “large dreams” he harbored for “the bedazzlement of men.” Modern media needed its own medium, the voice that would explain its transformative power to the world, and he would be it. McLuhan also saw, with biting clarity, how all mass media are fated to become tools of commercialism and consumerism — and hence instruments of control. The more intimately we weave media into our lives, the more tightly we become locked in a corporate embrace: “Once we have surrendered our senses and nervous systems to the private manipulation of those who would try to benefit by taking a lease on our eyes and ears and nerves, we don’t really have any rights left.” Has a darker vision of modern media ever been expressed? “Many people seem to think that if you talk about something recent, you’re in favor of it,” McLuhan explained during an uncharacteristically candid interview in 1966. “The exact opposite is true in my case. Anything I talk about is almost certain to be something I’m resolutely against, and it seems to me the best way of opposing it is to understand it, and then you know where to turn off the button.” Though the founders of Wired magazine would posthumously appoint McLuhan as the “patron saint” of the digital revolution, the real McLuhan was as much a Luddite as a technophile. He would have found the collective banality of Facebook abhorrent, if also fascinating. In the fall of 1979, McLuhan suffered another major stroke, but this was one from which he would not recover. Though he regained consciousness, he remained unable to read, write, or speak until his death a little more than a year later. A lover of words — his favorite book was Joyce’s Finnegans Wake — he died in a state of wordlessness. He had fulfilled his own prophecy and become post-literary. Portions of this essay appeared originally in the New Republic. Photo of texters by Susan NYC. This entry was posted in Uncategorized on October 18, 2014 by Nick. With texting you are losing several lives reading it and causing car crashes. I – There is no Goddess but Goddess and She is Your Goddess. There is no Erisian Movement but The Erisian Movement and it is The Erisian Movement. And every Golden Apple Corps is the beloved home of a Golden Worm. II – A Discordian Shall Always use the Official Discordian Document Numbering System. III – A Discordian is Required during his early Illumination to Go Off Alone & Partake Joyously of a Hot Dog on a Friday; this Devotive Ceremony to Remonstrate against the popular Paganisms of the Day: of Catholic Christendom (no meat on Friday), of Judaism (no meat of Pork), of Hindic Peoples (no meat of Beef), of Buddhists (no meat of animal), and of Discordians (no Hot Dog Buns). IV – A Discordian shall Partake of No Hot Dog Buns, for Such was the Solace of Our Goddess when She was Confronted with The Original Snub. V – A Discordian is Prohibited of Believing what he reads. The newspaper is exhausting and worth a few lives daily. If you don’t read the paper you are uninformed and if you read the paper you are misinformed. All praise the Sun and they shall have shine. An interesting sidenote… I recall reading in Philip Marchand’s biography “The Medium and the Messenger,” that after his stroke, McLuhan could not read, write or speak. However McLuhan could sing! At church, McLuhan belted out hymns he knew by heart. 1. His job was not dissimilar, as he saw it, from that of the artist. 2. I’ve always assumed that his abstract affect on TV appearances was an effort to put on a “cool” mask for viewers’ sake, to become an empty canvas upon which they could project their own perceptions (I think he describes Calvin Coolidge as having a persona that achieves the same thing). I’ve never thought it quite worked, though. 3. But McLuhan failed to anticipate that, as the speed and capacity of communication networks grew, what they would end up transmitting more than anything else is text. At the same time, let’s not ignore the rise of txt-speak (“OMG” and “lol” have almost, for me at least, become more like cool ideograms than hot alphabetic text), emoji, and now Facebook stickers and the upcoming Apple Watch scribbles. He might yet turn out to be more correct than it appears. Josh, I think defining MM as an “artist” is incorrect. We generally associate the term with individuals who transform cheap rather common plain materials into new artifacts that the greater community place a high value on usually monitary. When Jackson Pollack threw.paint. on canvas he transformed.l it into something rare and valuable. I don’t.see MM doing quite the same thing.